It is interesting to see how well some of my articles do and how some of them are basically flops. I don’t think it is the writing (each article has the same level of incoherent thought) but more of the programs that are featured on here. It is interesting to see what people like and what is less interesting. Take for example Sherlock. I have written two articles on the program this year. Checking the analytics on this blog and my Facebook page, it is clear that a lot of people like to read about it. In fact, it has given me some of my highest numbers. There is also the surprisingly popular article for Mulberry. I did an article that covered the entire series back in 2010. I thought it was a good article but people seem to keep reading it. In fact, I am still getting comments about the article even just getting one this week. Most of the articles do well but some not quite as well. The four articles for To Play the King started out really slow with readership. It seemed not a whole lot of people were interested. I think part of the problem may have been that instead of being able to give a decent amount of background to the series, I was watching it and writing about it with no former knowledge of the series plus I had a lot of bad guesses about what was going to happen with the series. Then there is As Time Goes By. Very few people read the article last week. Very few people even read my Facebook post about it. Apart from the fact that it is summer, there are a couple of things going against these articles. One is that I am picking these articles up with Series 4 opposed to starting from the start. I need to do this because I started from the beginning prior to me writing this blog. I could start over but that ain’t gonna happen! I thought putting the PBS spin on the article would have helped this dilemma but I guess not. Is it possible that the problem itself is As Time Goes By? Maybe it is a well-remembered series but is it one that people want to read about? It’s hard to say. There is a decent amount of traffic that comes to this blog everyday but few of them were reading the As Time Goes By article. By no means am I annoyed or upset by it, I just found it all very interesting. Big blogs or magazines would see what is popular and what is not then stop doing articles on what is not popular. I have no intention of doing that. Some of the stuff I pick is not nearly as exciting for me to watch but the point of the exercise is to watch the stuff I don’t always see and I need somewhere to write it. So, now on to As Time Goes By. The second half of the Series 4 had some big things happen for the series but also had some very enjoyable episodes. The big news is of course that Lionel and Jean got married. It was a very stylish and relatively low key affair. Neither Lionel nor Jean could figure out the best way to organize all of the details for the wedding. Lucky for them that Alistair volunteered himself to step in and take care of all the arrangements. Sometimes this guy comes across like a dweeb but more and more he actually feels like a good friend who genuinely cares for the two of them. The wedding took place at a registrar’s office, back to Jeans for hors d'oeuvres and then on to a restaurant. In my opinion, Lionel gets a little selfish and makes a plan so Jean and Lionel can get out early so they don’t need to go to dinner with everyone else. He is tired of talking to everyone. I think this is incredibly selfish. Why invite them in the first place? Lionel really couldn’t stick it out for another 4 hours or so? I don’t know why I am getting so bent out of shape as none of this is real but suffice to say, this does bother me. Lionel, I am sure a lot of those people didn’t want to come to your wedding either but were doing it to be nice. Oh, that’s right, he’s not real. I keep forgetting that. It is clear that Alistair’s skills and kindness to make Lionel and Jean’s wedding come off has not gone unnoticed. Judy is obviously very impressed. 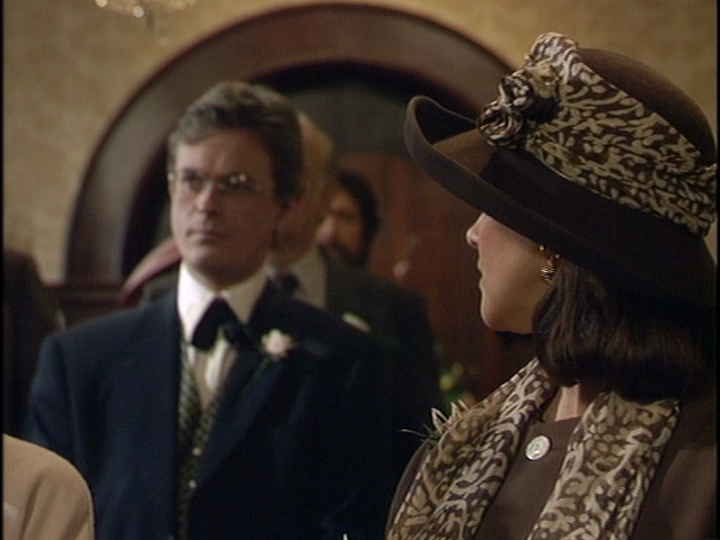 Alistair stepped in earlier in Series 4 to make Stephen and Penny’s surprise anniversary party go off without a hitch and he did it again with the wedding. Maybe there is romance in their future? Of course there is! Just not quite yet. Judy starts dating this man who is just about Lionel’s age. Now, Jean is concerned about this and Lionel starts to become concerned when they realize how dull he is. Of course, what no one brings up is that Lionel was hitting on Judy at the beginning of the series before he knew that Jean was Judy’s mum. Scandalous! Apart from all of the wedding and relationship stuff, Lionel’s mini-series is starting to film at Rocky’s place. It is a disaster with people in horrible clichéd British costumes and a very voluptuous woman playing a younger Jean. 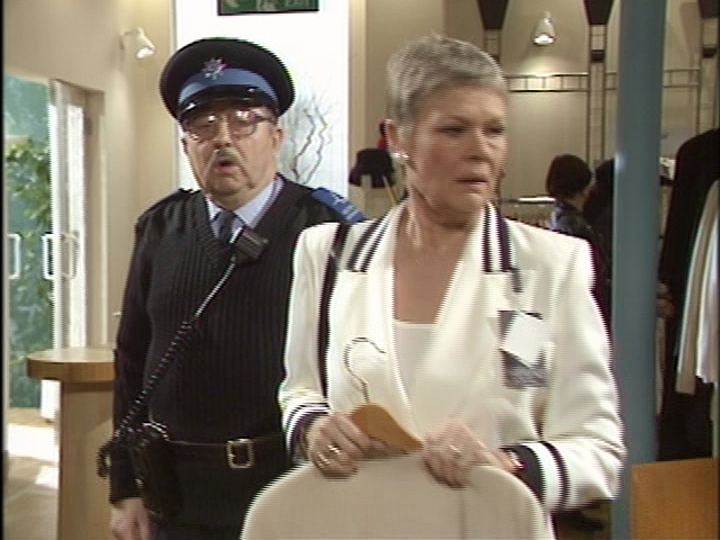 Keep a look out for Bob Boa who was in the Fawlty Towers episode Waldorf Salad, playing the younger Rocky for the mini-series. With the amount of disdain Lionel has towards the filming of the mini-series (beyond all the re-writes) it seems like he wishes he never got involved with it at all. Of course when he sees the size of the check he got, it did help him out a little. The overall series is very plush and comfortable. Lionel and Jean live a very comfortable life. 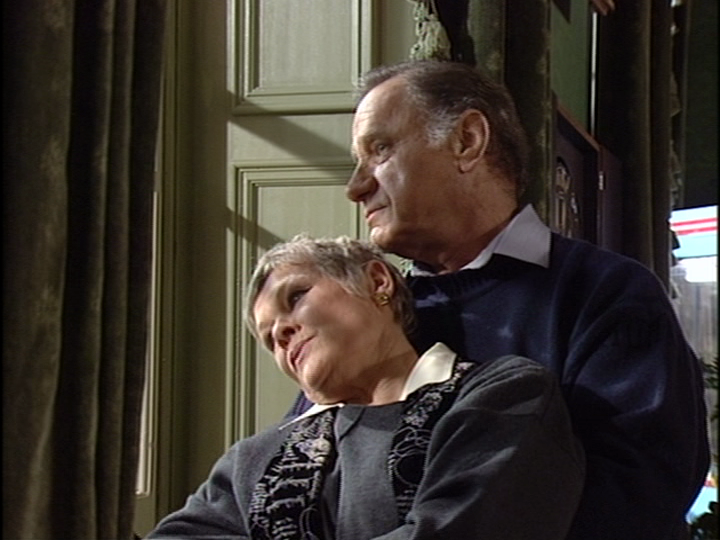 The scenes with them living in Jean’s house sitting on the couch or them reading in bed together with large comfy pillows and blankets makes me want to move in there. It is all so comfortable. They move at their own pace. Nothing is rushed. Lionel likes his custard tarts or he enjoys taking a walk down to the pub to have a “swift pint”. It all seems very enjoyable. I really do enjoy that pace for the series. It’s all relaxed. The comedy really does come out of the situations opposed to the characters. Sure, they all have personalities but it’s what situations the characters get into that are really funny. In Episode 7, Jean is looking for a new outfit for the wedding. She is so frantic about finding the right piece that she takes the outfit out of the store to see what the colour of the outfit looks like in sunlight. Of course what she does not realize is that she was shoplifting in the eyes of the security guard. It is all soon handled and we move onto the next part of the episode. The moment is funny and then we move on. It is not milked to excess and that is because Bob Larbey is too talented to allow that to happen. It is also interesting to note how television has changed over the past 20 years and also the difference between US television and UK television. 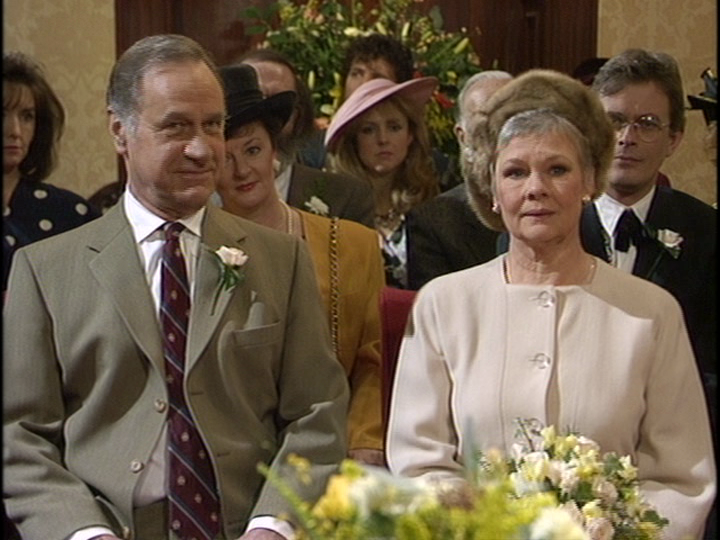 The wedding of Jean and Lionel is a pretty sizable event for the series. In the course of Series 4, Lionel proposes to Jean in Episode 5 and they are married and the plot moved on by Episode 8. There are 10 episodes in Series 4. If this was a US program, out of the twenty-something episodes of the season, the proposal probably would have happened very early on in the season, if not even by the first episode and then the engagement would be the main focus for the rest of the season. Even if the proposal came later in the season, it would have been probably in November for November sweeps. For the UK reader, what are Sweeps? These are periods within the year where US TV Networks try to get as many viewers to tune in because that information will be the basis of how much those networks can charge for commercial time to advertisers. The more viewers they get the more money they can charge for those programs based on how popular they are at that time. So, the marriage proposal would happen for the November sweeps, hugely advertised so people would tune in and the wedding would be a huge end of the season finale which would happen within the May sweeps period. Sweeps happen in November, February, and May. More British series are following in this direction but it is clear Bob Larbey knew what would make a good series and how he wanted his show to progress. To me, his way is more admirable. The cast is all really good in this. I originally wasn’t so sure about Philip Bretherton’s take on Alistair. It seemed like his portrayal of Alistair was really bad and fakey. I know Alistair is fakey but it almost felt like no one was laughing at the character’s jokes. I didn’t remember him like that in the earlier episodes from Series 1 -3. Then, when Alistair was being himself and helping out Jean and Lionel, he became much more real and I enjoy the character much more. Of course you could put Geoffrey Palmer in anything I would watch it. His pedigree for British television is immense. He is a national treasure. It’s good to see he has never left our screens. 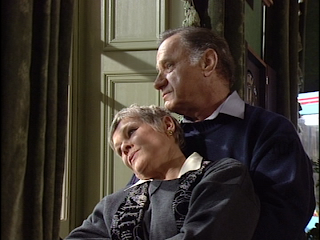 Now, Judi Dench is interesting. I will be honest; I have warmed to her more now than I have in years past. I am not a huge fan of hers but that may be because she is not generally in the type of stuff I would watch but with a couple of exceptions. I will never watch A Fine Romance simply because I have no interest in it at all. 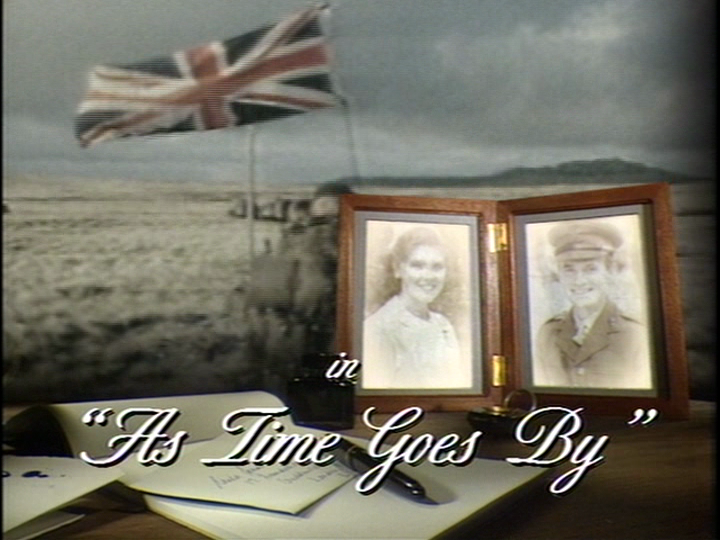 I decided to give As Time Goes By a go only because Geoffrey Palmer is in it. Once I realized that Bob Larbey wrote it, that helped matters too. I really did not like her when she became M in the Bond films. She grated on me a lot until Daniel Craig became Bond. The characters of Bond and M changed significantly in Casino Royale and so did their relationships. I think Judi is the perfect M for Daniel Craig’s Bond. Of course more on that later as I will be writing a series of articles for the upcoming release of Skyfall. I find it interesting that Jean Simmons was originally approached to play Jean in the series but declined. At that point Judi Dench came in to audition for the role. I can’t imagine Judi Dench needing to audition for any role especially auditioning for a BBC sitcom. The thought of that simply amuses me. Now that I have gone through Series 1 – 4 of As Time Goes By am I going to rush ahead to watch Series 5? I have really enjoyed the series so far but I am thinking that as much as I liked it, I think I will wait until I randomly pick it again. I just hope it’s not another 5 years. Putting space in my articles to talk about people who recently passed away is not meant to be an ongoing feature but unfortunately over the past month it has been. This week has given us some shocking news. It was disclosed this week that Mary Tamm has passed away at the age of 62. 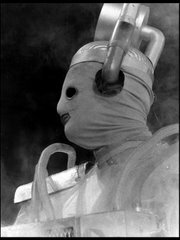 Mary had been known to so many of us Doctor Who fans as the original Romana. 62 is such a young age! She died from cancer and had been ill for some time. This is a shock and a very sad one at that. Just today as I was writing this article word started to circulate that Geoffrey Hughes had passed away at the age of 68. Unfortunately, he too died of cancer. Geoffrey had been in a wide range of television from The Likely Lads, Up Pompeii, Doctor Who and The Royle Family. 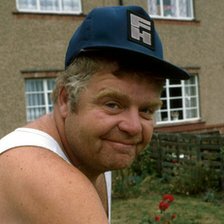 He was known to many as Eddie Yeats in Coronation Street and will forever be known to me as Onslow in Keeping Up Appearances. He was an actor that I would see in things and immediately like and I am truly saddened by the news of his death. Next week: Do you like plants? Well, I know of certain types of plants that would like you. Next week we see the first of 3 articles on the 1981 BBC series The Day of the Triffids. I am bummed out about the loss of Mary Tamm as well. She was the actress who played the first companion I ever saw on Doctor Who. I thought her performances were great and they should of kept her on for more. Obviously she was in my top five companions of all time. With Liz Shaw, Sarah Jane, Ace, and Jo Grant. Greg on a side note I might be receiving some extra copies of certain shows similar to what happened the time I ordered Only Fools and Horses Complete Series where the package got lost in the mail. I've got a complete list if you want to email me at reddwarf66622@aol.com. The loss of both Mary Tamm and Geoffrey Hughes has been shocking and just really sad. Cancer is horrible and I have often said that is will eventually take all of us. A bit gloomy I know but it gets so tiresome. Although of little solace for their respective families, us fans have a great body of their work we can enjoy for a very long time. 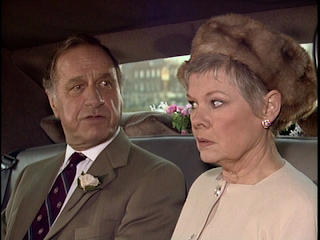 RIP Romana I and Onslow. You will both be missed.